Santa Croce is within the upper curve of the Grand Canal, in the western corner of Venice. The sestiere (district) is bordered by the Grand Canal to the north and the districts of San Polo and Dorsoduro. It's small and closely-packed, and includes one of Venice's busiest spots; the bus station at Piazzale Roma. Santa Croce is an area of contrasts, taking in the exhaust fumes of Piazzale Roma but also the slow charms of one of Venice's loveliest little squares, Campo San Giacomo dell'Orio. There aren't many of Venice's big sights here, but there are a few attractions to see as well as some picturesque canals and corners. The district still bears the name of a monastery which no longer exists. Santa Croce was demolished in 1810 and now a little public park, the Giardino Papadopoli, stands on the site. On this side of the Grand Canal it can be hard to work out which sestiere you are standing in: Santa Croce, Dorsoduro or San Polo. For sightseeing purposes I wouldn't necessarily tour these three districts separately because the boundaries are so blurred; it's more practical to plan a route on your map. Santa Croce and San Polo together make a manageable area for exploration. Santa Croce is quite a 'local' area, traversed by busy lanes used by Venetians and tourists to march from Piazzale Roma towards the Rialto and other parts of Venice. Off these thoroughfares are some sleepy corners and many dead ends. San Giacomo dell'Orio - a very old church with some interesting historical features. Piazzale Roma - not a tourist attraction but very important for travellers: the bus station/ferry hub and the only bit of Venice connected to the mainland by road. Ca' Pesaro - Baroque palace housing Venice's Museum of Modern Art, with works from the nineteenth century onwards. San Stae - church dedicated to Sant'Eustachio, facing the Grand Canal. Natural History Museum at Fondaco dei Turchi - only a couple of rooms are open in this Grand Canal building. Palazzo Mocenigo - palace open to the public, with displays of historic costume. There's a smattering of accommodation in Santa Croce, mostly around the transport hub of Piazzale Roma, and along the Grand Canal. It's a convenient area for arrivals and departures. There are some good places to eat in Santa Croce and its neighbour San Polo. 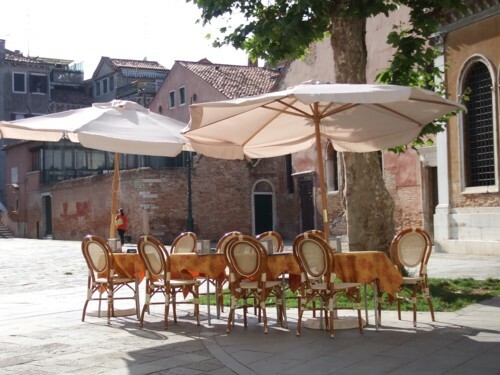 Our favourite restaurant, La Zucca, is in Santa Croce, and around the corner in Campo San Giacomo dell'Orio there are a couple of nice bars with outside tables. Just off the campo is a good pastry shop called Majer, which makes lovely little swan-shaped cream puffs. We recommend more places to eat on our Restaurants page.